This is a long one but it's chock full of good information! There are many ways of lacing corsets and bodices so I thought I'd share the most popular ways with you. Below you'll find tutorials with pictures for ladder lacing, spiral lacing, standard lacing for both V-shaped and hourglass corsets, and cross lacing. I also list out what periods use each lacing style and on which garments. Enjoy! To finish the lacing off, tighten the corset to your liking, readjust your bust and tighten again, then tie with a bow or double knotted bow. Tuck laces away for outerwear! **You can choose to lace the corset bottom to top like I described here or top to bottom, just reverse the directions! 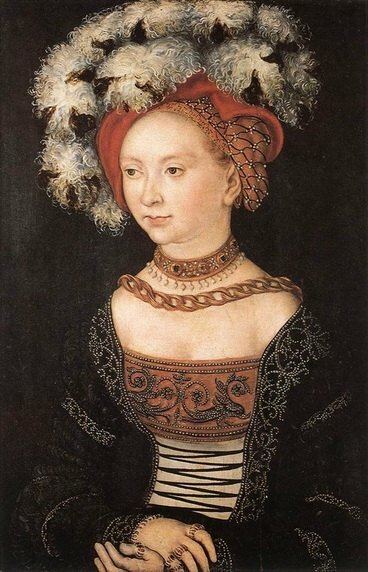 Note: The corset or bodice must be grommeted or eyeleted specifically for this lacing style. Unlike other ways of lacing, the grommets or eyelets will be offset at the top and bottom. This allows the lacing to come down on a diagonal or spiral angle. When purchasing your corset, be sure to select the Spiral Lacing option! Locate the pair grommets at top (or bottom) which are close together. Tie a slip knot to the top grommet. In the picture, this is the top grommet circled on the left. You will have a small loop tied tightly at the grommet and one long length of lacing. Be sure you did your slip knot so the small loop unties your knot and not the long lace! Otherwise you’ll unravel when you go to tighten your corset! If the slip knot is giving you trouble, a plain knot will do. Zig-zag the lace through the eyelets down to the bottom of the corset. In the picture I went over the grommets to the right, then under to the left, over to the right, under to the left, etc. This is the spiraling motion referred to in the name! To finish the lacing off, go under to the left and over to the right, tighten the corset to your liking, readjust your bust and tighten again, then loop your lacing though the bottommost grommet a second time and tie another slip knot. Tuck laces away for outerwear! **You can choose to lace the corset top to bottom like I described here or bottom to top, just reverse the directions. Go under to the right and over to left. For this style I like to go top to bottom but it’s really up to you! Now take the right lace and cross it to the left side, then right side, then left, then right, filling in the open grommets. Pull the laces and even out the gap in the lacing. Continue threading lacing through grommets until you get to the top of the corset. ​Note: Unlike V-shaped corsets, hourglass corsets are laced off the body. First find the center of your grommets from top to bottom and mark off these 4 grommets (2 on each side). Thread lacing straight across the bottom. Feed your left lace through the back of the bottom-left grommet and the the right lace through the back of the bottom-right grommet. Pull your lacing through until you have about the same length of lacing on both sides. Take the left lace and cross it to the right side, then skip 1 grommet and cross to the left side, skip 1 grommet and to the right, skip 1 and cross to the left, etc until you get to the center place you marked. At this point create a large loop by threading out of the first marked grommet and then back into the next grommet on the same side. Continue the lacing pattern as before until you reach the top. As the picture shows, your laces will be threading inside to outside. Now take the right lace and cross it to the left side, then right side, then left, then right, filling in the open grommets. Create another large loop by threading out of the first marked grommet and then back into the next grommet on the same side. Continue the lacing pattern as before until you reach the top. 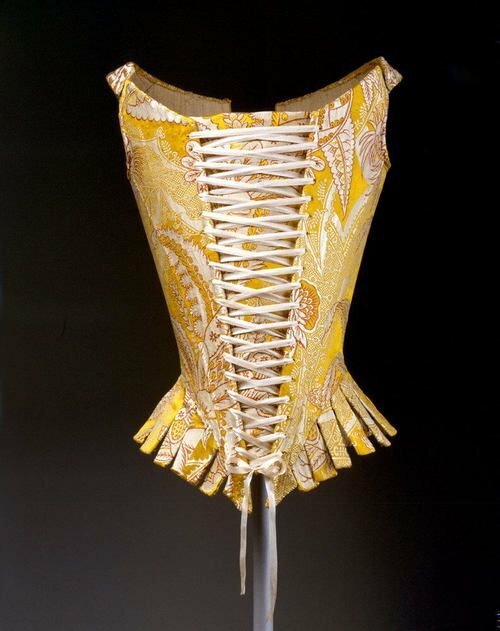 To finish the lacing off, tie a knot in the lacing at the top of the corset. Tighten the laces working from the top to the middle and bottom to the middle, pulling all the excess lacing into your two loops. To put on, open riveted busk and pull corset halves to loosen the laces. Wrap around your body, hook the rivets, tighten to your liking, readjust your bust and tighten again. You can tie your laces behind your back or wrap it around you waist and tie in front. 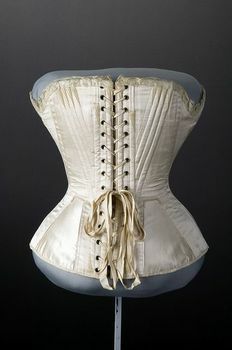 Note: Unlike V-shaped corsets, hourglass corsets are laced off the body. Take the left lace and cross it over to the right side, then skip 1 grommet and cross under to the left side, skip 1 grommet over to the right, skip 1 under to the left, etc until you get to the center place you marked. At this point create a large loop by threading out of the first marked grommet and then back into the next grommet on the same side. Continue the lacing pattern in the opposite direction until you reach the top. As the picture shows, your laces will be threading outside to inside. Now take the right lace and cross it over to the left side, then under to the right side, over left, under right, filling in the open grommets. Create another large loop by threading out of the first marked grommet and then back into the next grommet on the same side. Continue the lacing pattern in the opposite direction until you reach the top.